B1310LF is rated 4.6 out of 5 by 55. Rated 5 out of 5 by TeamErnie from Great faucet! I love Delta faucets and I bought this one and had our plumber install it. When it was time to pay for his services he told me he recommends Delta faucets. I have had Delta in the past and they are the best! Rated 5 out of 5 by Drawcad from Work's Great!!! We bought this a couple weeks ago, glad we DID! 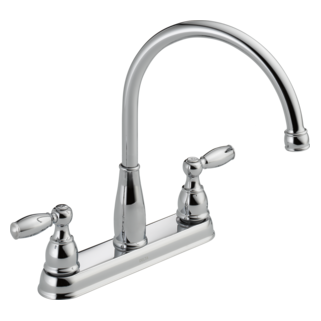 Rated 5 out of 5 by dee dee von from Great lightweight faucet I'm glad I bought this type/brand of faucet. 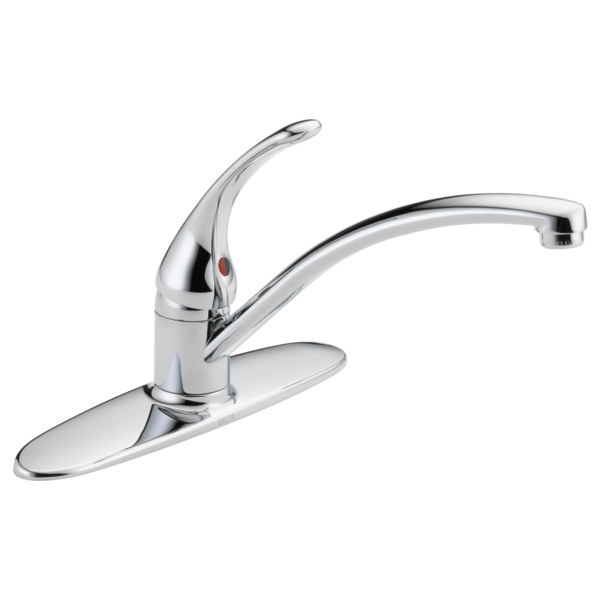 Rated 1 out of 5 by JONinSpokane from Four months and barely rotates to left and right This faucet is horrible! The center post attaches poorly and wobbles. The swivel is no longer swiveling (at four months after install). Never again. 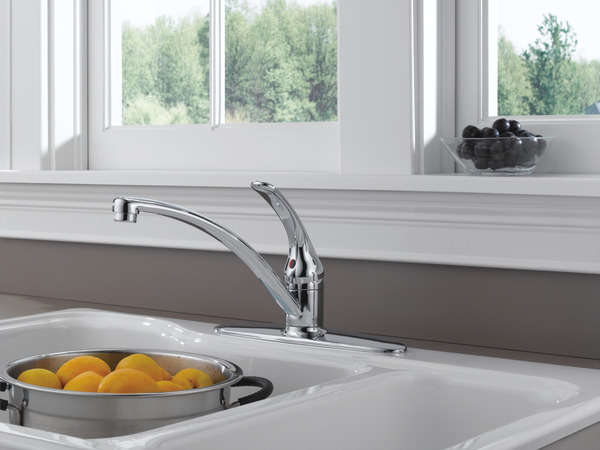 Rated 5 out of 5 by Jimbo from Looks good too Great faucet and guarantee. Looks great too. I got the stainless steel finish and it's perfect in my kitchen. Can you connect your existing sprayer to this? I already have a sprayer, just want to replace the faucet. 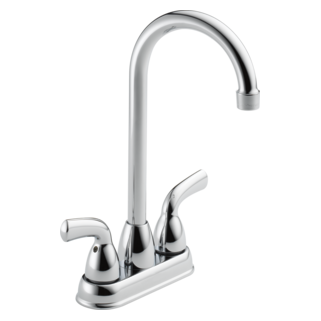 Can you attach the existing sprayer to this faucet? Do I need to buy a part to do this? If so, what parts do I need? How to get a replacement gasket on a b1310lf model? After a few years of good service, the gasket wore down, and I had to remove the faucet to prevent water damage below, all is in great condition, except the gasket is in bad shape, and cracked at one end. looked for a replacement part, but did not find. Can this be purchased individually? What size allen wrench do I use to tighten the set screw on the handle? I notice the copper water supply tubes are much skinnier than your previous models -- like 1/4&quot; (or even smaller diameter) -- the screw fitting will fit fine, but why did Delta reduce the size of the copper tubes? I was wondering if it was to reduce water pressure to be easier on the faucet. Will I notice any difference in water flow out of this faucet? 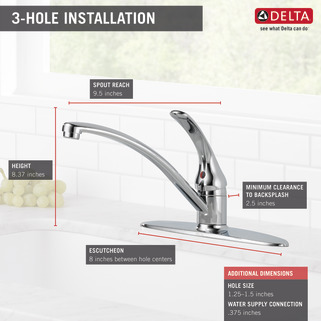 I hesitate using one with the plastic pipes although I just talked to a property manager friend of mine and he says they are fabulous -- easy to install and he has even re-used them after remodeling. Just wondered about this one with the skinny copper inlet tubes, though. How do you regulate water flow and pressure? I just noticed the repair kit for my B1310LF is now RP77763. Does this kit replace the RP77738 as well as the RP77738A?